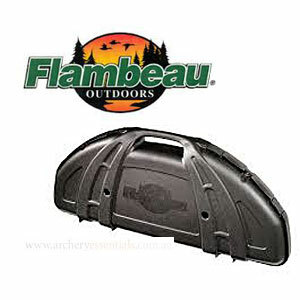 Flambeau Standard Bow Hard Case is airline approved and holds bows up to 38 in length. Has quick detach quiver holder that allows quiver to be stored in case with arrows in the quiver. Has a removable storage box, tie down strap for release and arm guard, extra thick handle, large wide angled feet for stability, 4 steel hinge pins, tabs for strapping case to ATVs, 3 padlock tabs and thick convoluted foam padding. Holds 6 arrows. Length of case is 44 inches..
Dimensions: 113 x 53 x 22cm.